Part two. You may read Part 1 here. Robert E. Lee had already decided on a course of action by the time Maj. Gen. Jeb Stuart arrived at his headquarters around noon on August 17 outside Orange Court House. Facing Lee was Maj. Gen. John Pope’s Army of Virginia. Pope held a line along the north bank of the Rapidan River with his back to the Rappahannock. Lee was concerned with the possibility that elements from McClellan’s army might join Pope via Fredericksburg. As such, Lee intended to assail his enemy’s left flank. The Confederate commander directed Maj. Gen. Thomas J. 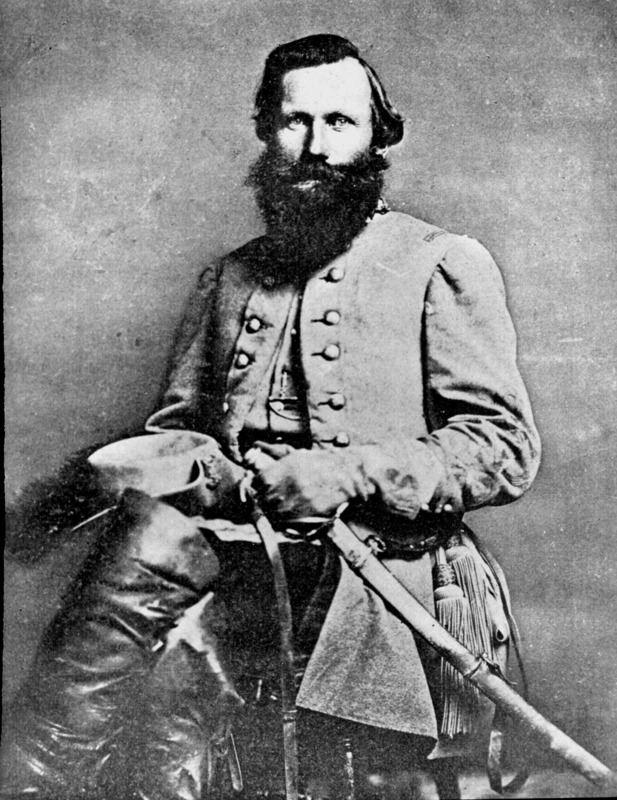 “Stonewall” Jackson to cross the Rapidan at Somerville Ford while Maj. Gen. James Longstreet moved over Raccoon Ford. Stuart, in company with Brig. Gen. Fitzhugh Lee’s brigade was also assigned the task of crossing at Raccoon Ford. From there, the gray cavalry was to cut off Pope’s line of retreat by destroying the bridge at Rapphannock Station. The Federals would then be pinned between the river and Lee’s infantry. The Confederate movement was slated to begin the next day. As aggressive as Lee was, his timetable for the offensive was unrealistic. Elements from Longstreet’s command had still not arrived. Fitz Lee, who was to play a major part in the plan, was also still en route from Beaver Dam. Anxiously awaiting the arrival of his horsemen, Stuart, John Mosby, Heros Von Borcke and Captain St. Pierre Gibson from the 4th Virginia Cavalry rode out the Orange Plank Road to the hamlet of Verdiersville early that evening to meet Lee. Waiting for the small party was Stuart’s Adjutant General, Maj. Norman Fitzhugh and Lt. Chiswell Dabney. Stuart had dispatched them earlier in the day in the hopes of locating Lee. The two men reported they had not heard from or seen the brigade. Surprised at this news, Stuart dispatched Fitzhugh to find the missing Confederates. Fitzhugh rode off as his chief bivouacked for the night at nearby farmhouse owned by Catlett Rhodes. Stuart’s adjutant had not gone far when he encountered a column of riders. It was not, however, his fellow Confederates. In the darkness, Fitzhugh had stumbled upon the 1st Michigan Cavalry and 5th New York Cavalry under Col. Thornton Brodhead, a veteran of the Mexican War. Brodhead had been dispatched to patrol the Union left and had slipped across the Rapidan when Brig. Gen. Robert Toombs recalled the two regiments guarding Raccoon Ford. Fitzhugh was quickly taken prisoner and the Federals continued their march toward Verdiersville. Stuart’s party bolted in different directions to avoid capture. Fortunately, they were able to get away. Along with the personal belongings, Brodhead also found papers outlining Lee’s plan to attack Pope. Once received, Pope decided on a retrograde movement and withdrew to the north bank of the Rappahannock, leaving the Confederate commander to cast about for other options. This entry was posted in Armies, Battlefields & Historic Places, Campaigns, Cavalry, Civil War Events, Leadership--Confederate and tagged 1st Michigan Cavalry, 5th New York Cavalry, Fitzhugh Lee, Heros von Borcke, JEB Stuart, John Mosby, John Pope, Norman Fitzhugh, Robert E. Lee, Robert Toombs, Thornton Brodhead. Bookmark the permalink. Cavalry stories are always a good read-thanks.